Jordan, a country in the Middle East bordered by Saudi Arabia, Iraq, Syria, West Bank, Israel, and the Dead Sea has a total land area of 35,637 square miles and a population of around 6.41 million. With its highly educated population, Jordan has one of the highest standard of life amongst the developing countries of the world. Tourism and pharmaceuticals are the major sectors of its economy with medical tourism gaining in popularity. Phosphate, potassium, salt, natural gas and stone are the most important exports. It has significant deposits of oil shale and uranium upon which future economic growth is pinned. Its immense diversity is proof of its stability and tolerance. The best time to visit Jordan is during spring (Mar- May) and fall (Sep – Nov). The major tourist attractions are Mataba, River Jordan and Mount Nebo for the pilgrims and Petra in Wadi Musa, Wadi Rum, Dead Sea, and Amman. Cuisine of Jordan is similar to the region and is salads, cooked vegetables, rice, bread, meat, fish or poultry. The Rough Guide to Jordan 978-1848360662 $17 Accurate historical info, great maps, and excellent coverage of the major sights. Jordan Travel Map by Globetrotter 978-1847735379 $9 1:730,000 scale. The first stamps of Jordan were a set of eleven stamps released in 1920 which were overprints on Palestinian issues. The set (Scott #1 to #11) catalogs for around $30 mint and around $100 used. Overprints on Palestinian issues continued until 1923. The territory along with Palestine was mandated to Great Britain after World War I. Overprints on issues of the Kingdom of Hejaz (Saudi Arabia) along with overprints on Palestinian issues were both issued and used in 1923. Hejaz overprints continued until 1927. Some of the overprints are inexpensive fetching a few dollars while valuations for certain rare ones go into the thousands. The first original issues of Jordan were a set of thirteen stamps released between 1927 and 1929. The set (Scott #145 to #157) catalogs for around $230 mint and around $290 used. The issues portray Amir Abdullah ibn Hussein, the ruler of Jordan between 1921 and 1951, first as Emir under a British Mandate and then as King of Jordan from 1946. He was assassinated in 1951 following rumors that Lebanon and Jordan were discussing a joint peace agreement with Israel. He is credited with playing a key role during the Great Arab Revolt against Ottoman rule between 1916 and 1918. A long set of fourteen stamps issued on February 1, 1933 showing King Hussein and Ancient Architecture. The set (Scott #185 to #198) catalogs for around $650 mint and around $950 used. The designs show Mushetta, Nymphaeum of Jerash, Kasr Kharana, Kerak Castle, Temple of Artemis or Jerash, Aijalon Castle, Khazneh Rock-hewn Temple of Petra, Allenby Bridge on River Jordan, portrait of Emir Hussein, and Ancient Threshing Floor. Jordan is a major tourist destination of the Middle East with numerous ancient sites, desert castles, and religious sites. Petra, an archaeological city dating back to the 6th century BC era is a UNESCO world heritage site and one of the New Seven Wonders of the World. Jerash is a well preserved Roman city. Kasr Kharana is a well preserved desert castle built around the 8th century. A long set of thirteen stamps released in 1954 in the Ancient Architecture theme. The set (Scott #306 to #318) catalogs for around $70 MNH and $30 used. The designs show El Deir Temple of Petra, Dome of the Rock, King Hussein, Treasury Building of Petra, and Al Aqsa Mosque. Dome of the Rock is a religious shrine located on the Temple Mount in Jerusalem. 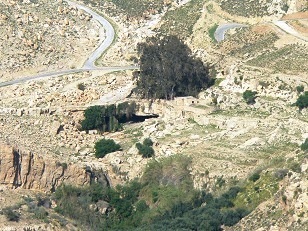 It is maintained by the Ministry of Awqaf in Amman, Jordan. A set of nine stamps released on October 5, 1968 showing Protected Game. The set (Scott #552 to #558 and C49 to C50) catalogs for around $65 MNH and $20 used. The designs show European goldfinch, rock partridge, ostriches, sand partridge, Dorcas gazelle, oryxes, and Houbara bustard. Jordan has released a few other sets in the flora and fauna context over the years making it a good collectible theme. A set of five stamps and a souvenir sheet released on April 9, 1983 to mark the massacre at Shatila and Sabra Palestinian Refugee Camps. The set (Scott #1145 to #1149 and #1150) catalogs for around $20 MNH and $5 used. The designs show victims, children, and wounded child. The massacre happened between September 16 and 18 of 1982 during the Lebanese Civil War. The massacre resulted in the death of between 328 and 3500 Lebanese and Palestinian civilians. It was done by Christian Lebanese Phalanges as a revenge for the assassination of Lebanese Christian President Bashir Gemayel. A set of three stamps released on April 7, 1997 to mark the centenary of the discovery of the Madeba Mosaic Map. The set (Scott #1563 to #1565) catalogs for around $4 MNH and around a dollar for used. The designs show Karak, River Jordan, Jerusalem, and the Map. Magada Map is the oldest surviving original cartographic depiction of the Holy Land and Jerusalem dating back to the 6th century AD. The first coins of Jordan were Bronze Fils (100 Fils = 1 Dirham, 100 Piastres = 1 Dian from 1992) issued in 1949 showing Value and Date within crowned circle with sprigs in Obverse and Value within Circle and Date in Reverse. The issue catalogs for around $4 UNC. There is a Proof variety with very low mintage (25) and that can be had for around $50. Prior to 1949, Palestinian Pound was the currency in Jordan. Coins $2 and up Common Fils from the 1940s onward in VF starts around $2. Bi-Metal Dinars from the 1990s in UNC starts around $10. Anniversary issues in UNC starts around $40. Silver Proofs and other low mintage issues from the 1960s starts around $100. Gold coins and certain rare commemorative silver proofs go well into the 100s and 1000s. Paper Money $3 and up Recent Dinars in UNC starts around $3. High Values and Fancy Numbers in UNC start around $25. 10-piece Dinar bundles from the 1990s, Replacements in UNC, etc start around $50. UNCs of the first ten serial numbers, High Values from the 1940s and prior dates, and bundles go into the 100s. Mosaic works, pottery, and salts and minerals from the Dead Sea are magnets for visitors. Art $10 and up 19th century photo and other local scenes prints start around $10. Original works by Jules Guerin, David Roberts, Lebron James, Edna Hibel, Marcus Uzilevsky etc start around $40 and go well into the 100s. Antiques $10 and up 19th century maps start around $10. 18th century and older maps go much higher.